The fake University of Farmington's website. DETROIT — Federal agents have been using a fake university located in Farmington Hills to help find undocumented immigrants allegedly scamming the system to become United States citizens, an unsealed federal indictment said. The sting operations took place from February 2017 until earlier this month, during which undercover agents posed as owners and employees. The fake university was dubbed The University of Farmington, and was allegedly located in Farmington Hills. “Each of the foreign citizens who ‘enrolled’ and made ‘tuition’ payments to the University knew that they would not attend any actual classes, earn credits, or make academic progress toward an actual degree in a particular field of study – a ‘pay to stay’ scheme,” the indictment reads. It added that the university was being used by foreign citizens as a “pay-to-stay” scheme that allowed immigrants to stay in the United States. The indictment stated that they were involved in the Student and Exchange Visitor program, which is run by the Department of Homeland Security. Each student allegedly knew the programs were not approved by the department, and that the process was illegal. In total, eight people were charged with participating in a conspiracy to help at least 600 foreign citizens to stay in the U.S. They allegedly spent time as recruiters from the university and profited from the scheme, the indictment says. “These suspects aided hundreds of foreign nationals to remain in the United States illegally by helping to portray them as students, which they most certainly were not,” said Steve Francis, special agent in charge of U.S. Immigration and Customs Enforcement’s Homeland Security Investigations office in Detroit. 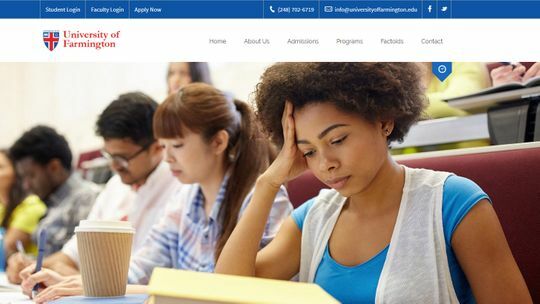 The University of Farmington website was still online as of Wednesday, Jan. 30, and can be viewed at https://universityoffarmington.edu. In 2016, Homeland Security agents also created the fake University of Northern New Jersey to charge 21 people with student and work visa fraud.